As I eagerly await the glorious explosion of color about to take place upon the landscape, I’m going with another autumn themed post of this weeks Photo Challenge. 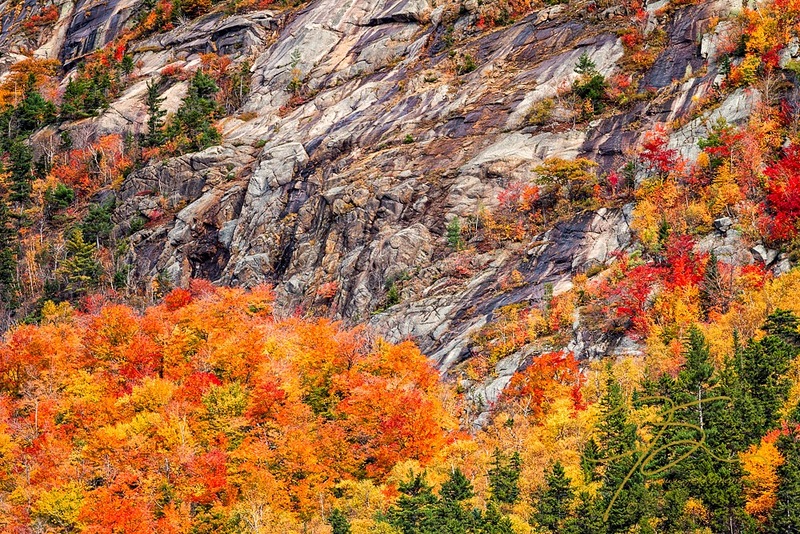 Most people visiting New Hampshire during autumn, come for scenes like this one showing fall in all its glory. Not me, at least not always, and definitely not on one particular day in early October of last year. I was looking for a unique point of view. Photographs that depicted the peak of autumn color, yet could be displayed year round and not seem out of place with the season. Since I was after an abstract style of photo, I felt that each photo should engage the viewer and leave them asking, “what is that?” Recognizable, even if only slightly, as something in nature while inspiring the viewer to invest more than a casual glance. Would you believe that these photographs are of the same scene and as close to mirror images of each other as I could get? 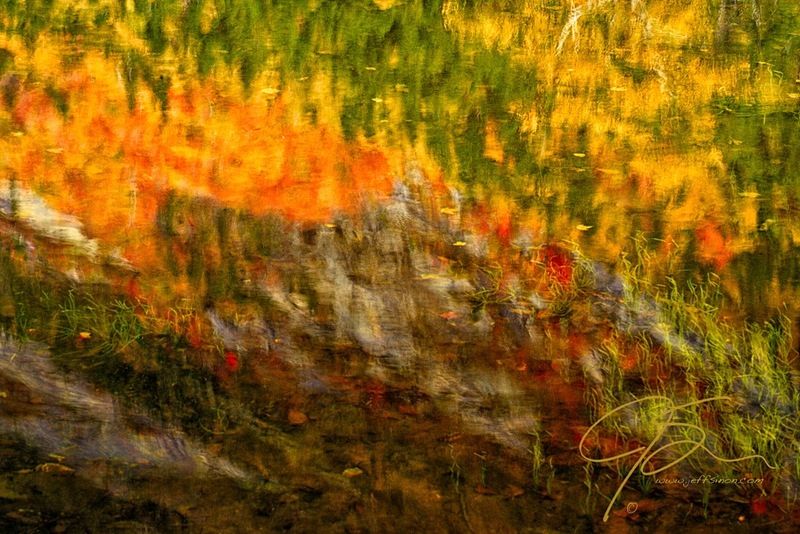 The second, which by the way, the client loved and is now printed BIG on canvas and hanging on her wall, is the same sheer granite wall, the same splendid fall foliage, as in the first photo, only in the second it is reflected on the rippled surface of a small pond at the base of the cliffs. But what do fish have to do with anything? Well now, that’s a funny story. I started the day with a beautiful sunrise, and an iconic New England scene, complete with white steeple church surrounded by mountains of color. Then I finished the day off with a moose. All of which can also be seen in this post from last year. However, during the remainder of a long full day in the mountains of New Hampshire, even though surrounded by glorious mountain scenery at the height of autumn color, I rarely pointed my camera directly at the foliage laden scenery, and when I did it wasn’t in a conventional way. Most of the time I was photographing it indirectly, through reflections, or using camera motion to capture all the vibrant color in a unique and abstract way. By panning my camera, both vertically and horizontally during exposure, or setting it low to the waters surface to capture the reflection, I was able to create the series of abstract images I sought for my client. Anyway, let me finish my fish story. Without exception, at any place I was photographing, no matter how beautiful the scene, I was the one and only photographer, among the hoards of tourists and other photographers, who was pointing their camera at the water. Quite often I would walk up beside a group of tourists, immediately get down on my knees to set up my camera, pointing down at the water, take a few shots, then get up and leave. The puzzled look on their faces, as they watched this guy with a bag full of expensive gear, who never once looked up at the scene everyone else was admiring, was priceless! Fantastic photos and a great story! Thank you. Now if there were alligators, THAT’S what I would be photographing! It’s so funny how people have certain ideas in their head of what constitutes a good photo opportunity. Then when they observe somebody photographing something outside “the norm” the funny looks appear. I have had many of those funny looks, which used to make me really self-conscious, but I’m used to it now and just ignore them :). Your abstract is amazing by the way, and this is a great post!! Reflections can create some amazing results. Thanks Cindy. I used to be mildly self conscious when out photographing the way I do, but stopped caring when I realized the photos I was getting were different, often very different that what everyone else was getting. If I only wanted snap-shots I would just walk up, grab a shot and go, but I want more than that. Love your Impressionist painting and the post from last year. The colors of fall are beautiful! Now I will look at the attachment …for fish?? HAHAHA! !Z Very funny Jeff ! Ahhh, the color! I think of abstracts as geometrical and hard-edged. I like the soft look here very much. Thank you. I find the beauty of nature is quite easy to convey, even if the subject isn’t easily identifiable. Ok, I think ALL of your work is amazing, but your Autumn images are by far some of the most beautiful photos I have ever seen! You have an amazing eye for nature!! Love it! Such a beautiful array of colours in your first photo. Thank you Colline. I can barely contain myself in anticipation of this years colorful display. The colours are what I love most about Fall. And each year the colours seem to be different. You are so right. A few years ago we had none of the brilliant reds New England is known for. Mostly yellows, oranges, and browns. For an out-of-towner it was still a pretty good fall that year, but for us locals it was a major disappointment. Thank you Dorothy. Try hitting the subscribe button on the right. Then you’ll get an email notification. I hate to admit that I’m terrible at checking my reader. The blogs that I get email notifications of I never miss. I may not always leave a comment or a like, but I read every one I get an email for. Great story and that is a wonderful abstract Jeff! But…Were there fish in there? I thank you for this. Had a not so great or productive, successful, or anything, day, & then read this post. I smiled. Your pictures are also amazing. Autumn! My favourite season. Thank you very much. While I’m truly sorry to hear about your day, it pleases me immensely that my words and photographs were a bright spot in an otherwise dreary day. That to me means my images were successful. I do hope for better days ahead. Thanks David. Isn’t great when you get to have fun taking pictures and confuse the people watching you? Love the 2nd one Jaff. Both are beautiful! Love the reflection. 😆 I remember that post and dumb tourists 😀 That watercolour painting shot is outstanding! You never fail when it comes to landscape photography Jeff! Thanks Cardinal. I’m always happy to hear I’m not the only one who thinks I’m not half bad with a camera. 😉 Though I still often think, when the landscape looks as good as the ones where I place myself, it’s almost easy. I know there’s much more to it than “being there,” experience, and knowing when to “be there” has a lot to do with it. It sure looks as if there could be fish in there. Have you followed through with your plan to add a packable fly rod to your camera gear bag? I do have the rod Gary, just haven’t used it as much as I should. That is abstract art Jeff! Must look stunning on your clients wall. Thank you Niina, thank you very much! Well come on over, the season hasn’t even begun yet! And thank you very much! You’re so right, learning to see more than the obvious right in front of me is probably the hardest thing I’ve had to learn. Still learning actually. Thanks Angie. Definitely, the next time you’re photographing at a really touristy location, take a look around and see what the masses are missing. You might be pleasantly surprised at what you find. It’s fun. Thinking about different angles and POV. Capturing or producing something different than what the view expects. Nicely done! Thanks Rick, I couldn’t agree more. The more popular the location the harder I look for that unconventional shot too. I’m just not fan of making carbon copy photos of what everyone else has already done. The eye of the photographer are different kind of eyes. You know I love your abstract photographs. Thank you ever so much Valentina. Considering your impeccable eye for design and sense of style, I hold your opinion in the highest regard. Its really very beautiful, very colorful. Lovely photograph. Thanks Jeff . . .I love both pictures, also great story, dude! . . .
LOL – great story and beautiful photos! There is some processing involved, but not in creating the shot. If you can get both images on your screen at the same time, you’ll see that the second photo is almost a mirror image of the first. At the base of the cliffs in the first photo there is a small pond, the second is the reflection on the rippled surface of the water. It’s as close as I could get as far as composition to mirroring exactly the first shot.